This entry was posted in Arizona & Local, Legal News on March 7, 2019 by Tara. In First: Sandra Day O’Connor, hi storian Evan Thomas describes how Ronald Reagan, who nominated Sandra Day O’Connor to the Supreme Court as the first female justice, characterized her as “a person for all seasons.” Thomas’ biography of O’Connor fleshes this description out, chronicling O’Connor’s childhood on an Arizona ranch, her time as a student at Stanford University and Stanford Law School (which included a marriage proposal from fellow student and future Supreme Court Justice William Rehnquist), the years she worked as a legislator then as a judge in Arizona, and her groundbreaking role on the Supreme Court. 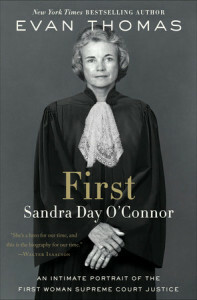 First also provides intimate glimpses in to O’Connor’s private life, including her marriage with John O’Connor and her relationships with her fellow Justices (the civil but cold relationship with Justice Antonin Scalia is amusingly illustrated via the description of a tense doubles tennis match). The book also delves in to O’Connor’s anguish over her cancer diagnosis in the late 80’s and sorrow over the dementia diagnosis in 2018. First is full of insightful entries from O’Connor’s journals, her late husband’s private memoirs, and excerpts from letters to family, friends, and colleagues. It also contains engaging interviews with O’Connor herself, as well as former classmates, romantic interests, colleagues, and law clerks. Through these unique and private materials we are shown a three-dimensional portrait of O’Connor. Thomas has written a biography of O’Connor that is distinctive in material and scope. It is an engaging history of a singular woman. We highly recommend it. This entry was posted in Arizona & Local, Law Library Resources on March 7, 2019 by Tara. 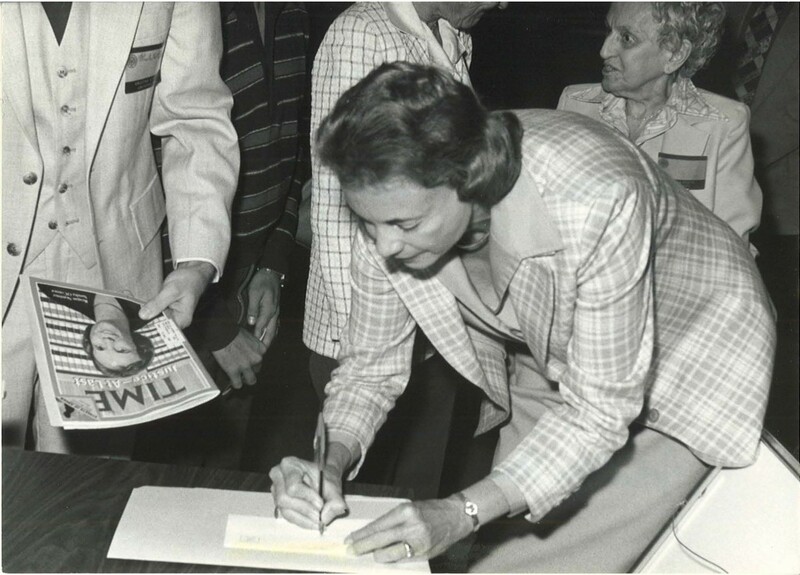 After final exams are over and you have some free time on your hands again, you may be interested in checking out a new exhibit which traces Sandra Day O’Connor’s life through photographs, artifacts, and other visual imagery. The exhibition, titled “The Cowgirl Who Became a Justice: Sandra Day O’Connor,” examines the intersection and divergence of the ranch life of O’Connor’s childhood and her years spent as a judge in both Arizona and Washington, D.C. It runs through May 23rd at the McClelland Irish Library at the Irish Cultural Center in downtown Phoenix. This entry was posted in Arizona & Local, Law Students on November 20, 2014 by Tara. Congratulations to ASU’s Diane Humetewa on her historic appointment to the U. S. District Court for Arizona. The U. S. Senate voted unanimously to confirm her yesterday, Wednesday, May 14th! This entry was posted in Arizona & Local, Indian Law, Legal News on May 15, 2014 by Leslie Pardo. A new book in the Law Library collection, The Glannon Guide to Secured Transactions provides a concise review of secured transactions topics through multiple-choice questions and explanatory answers. Another new book in the Law Library, Emanuel’s Secured Transactions outline provides a comprehensive breakdown of the topic into outline format with both summary and detailed versions of the main issues within secured transactions. This entry was posted in Arizona & Local, Law Library Resources, Law Students on May 21, 2013 by Tara. Hopefully you signed up early to attend Thursday’s book-signing event for Justice Sandra Day O’Connor’s book reading and signing event for her new book Out of Order: Stories from the History of the Supreme Court. This event is now sold out; Out of Order is out of tickets! 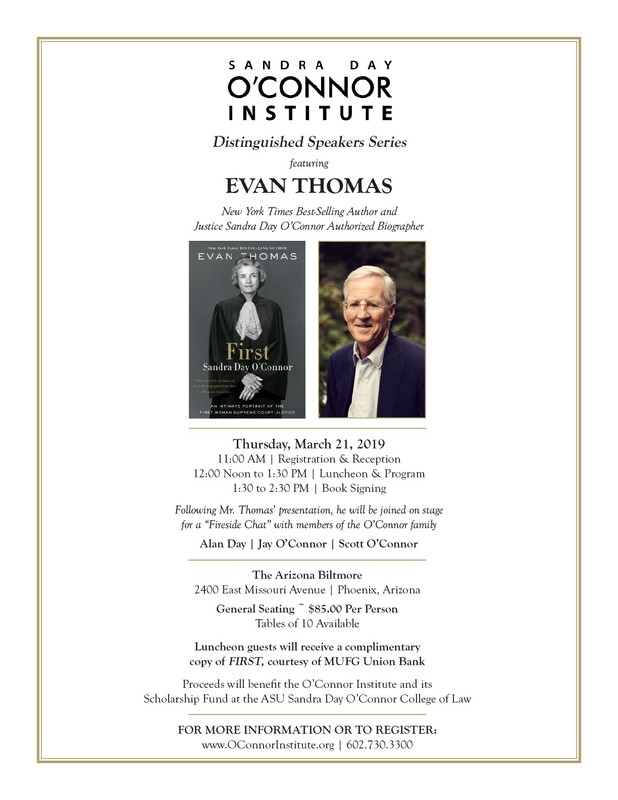 If you’ll miss the event, you can check out the book from the Law Library’s collection or purchase it from event co-host Changing Hands Bookstore or other retailers. We also found this recent NPR interview with Justice O’Connor about the book (39 min). This entry was posted in Arizona & Local, Law Library Resources on March 5, 2013 by Sara Lipich. Manifest Injustice, by Pulitzer Prize-winning journalist Barry Siegel, details the story of Bill Macumber and the efforts of the Arizona Justice Project, led by lawyer Larry Hammond and Sandra Day O’Connor College of Law Professor Bob Bartels, on his behalf. In 1974 Macumber was convicted for a double homicide that occurred in 1962, despite his assertion of innocence, questionable evidence linking Macumber to the crime, and a confession from a violent criminal. Manifest Injustice artfully reconstructs the past, detailing the chain of events that led to Macumber’s conviction, and chronicles the present-day fight for his release. You can learn more about the Arizona Justice Project and its work to overturn wrongful convictions in Arizona at www.azjusticeproject.org. Update: The Arizona Justice Project is hosting a conversation with Bill Macumber and Berry Siegel, the author of Manifest Injustice, on March 4th at 4:30pm in the Sandra Day O’Connor College of Law Great Hall. Autographed books will be available at the event and a reception will follow at 6pm. See the event flyer for more details. This entry was posted in Arizona & Local, Law Library Resources, Legal News on February 19, 2013 by Tara. The Arizona Supreme Court has allowed 3Ls to sit for the Arizona bar exam under a three-year experimental program that goes in to effect on January 1, 2013. You can read the Court’s order amending Rule 34 of the Rules of the Supreme Court here. Background information on this change is available in our March 2, 2012 blog post. This entry was posted in Arizona & Local, Law Students, Legal News on December 14, 2012 by Tara. Since so many of us at the Law School enjoy the company of our furry friends we thought it might be nice to help animals less fortunate than our own pets with a donation drive for the Arizona Animal Welfare League and SPCA. Founded in 1971, the Arizona Animal Welfare League and SPCA is Arizona’s oldest and largest no-kill shelter. Their facilities provide a temporary home for nearly 2,000 dogs and cats every year. Their mission is to provide excellent care, protection and loving compassion for the life of the animals and to take a leadership role in promoting humane values for the benefit of all animals and people. They are supported entirely by private funding. To see a list of items the Arizona Animal Welfare League especially needs, please click below. Donations will be accepted until December 28th. Thank you for your generosity in supporting our furry friends & Happy Holidays from the Law Library staff. This entry was posted in Arizona & Local, Law Library News and Events on November 27, 2012 by Leslie Pardo. Eighteen states (including Arizona) and the District of Columbia now allow for medical use of marijuana. The medical marijuana laws of these states are in direct conflict with federal law, however, as the Controlled Substances Act prohibits the cultivation, distribution, and possession of marijuana. This has created an incongruous situation in which an individual may be using medical marijuana in compliance with state law but is concurrently violating federal law, and thus exposing him or herself to federal prosecution. While the U.S. Department of Justice stated in a 2009 Memorandum to U.S. Attorneys that federal prosecutors should generally not focus their resources on “individuals whose actions are in clear and unambiguous compliance with existing state laws providing for the medical use of marijuana,” prosecution is still a real possibility. To learn more about the Medical Marijuana Program in Arizona check out the Arizona Department of Health Services webpage. This entry was posted in Arizona & Local, Legal News, National & International on November 16, 2012 by Tara.